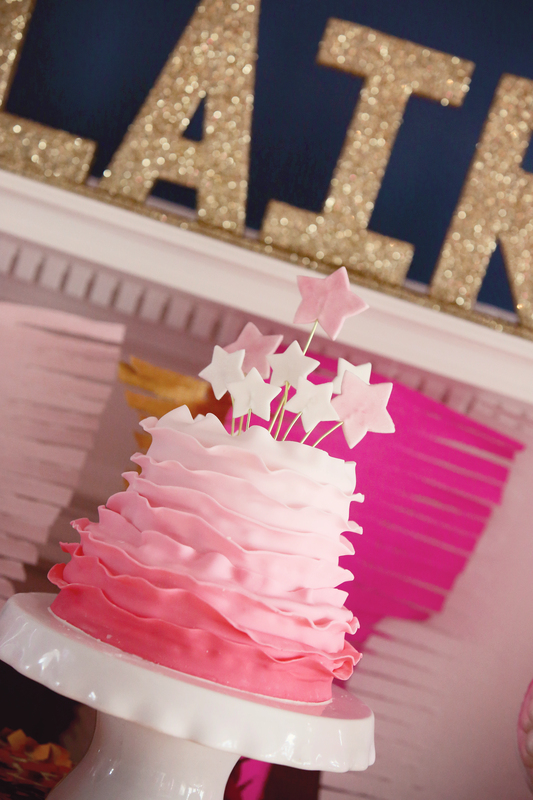 If you have a little girl who loves glitter and all things sparkly, here’s an idea for a birthday party! We hosted such a party for my daughter’s 7th birthday. 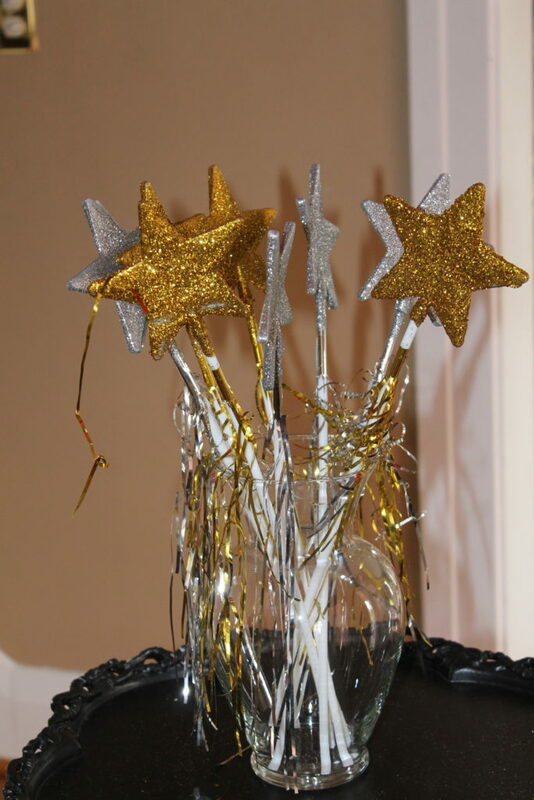 The planning and decorating for this event were a lot of fun…anything metallic, shiny, and sparkly! 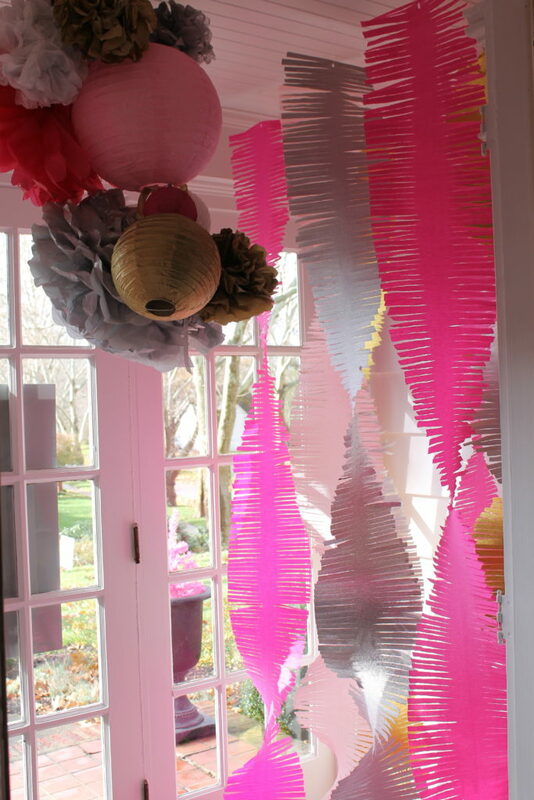 I loved this idea of creating big fringe garlands from OH HAPPY DAY! I ordered various colors (shades of pink, silver, white, and gold) of Italian crepe paper, and I began folding and cutting, and folding and cutting, and folding and cutting…did I mention how many times I folded and cut this exquisite crepe paper? Finally finished, I attached the garlands to the ceiling with clear removable hooks. I also hung a few in my entryway so the girls saw them as they arrived at the party. 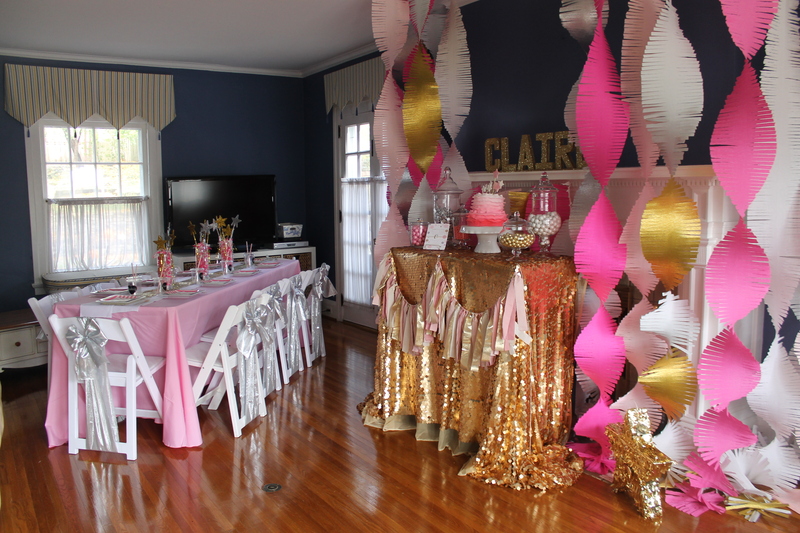 I covered my buffet server with some gold sequin fabric, and hung an equally sparkly tassel banner on it. 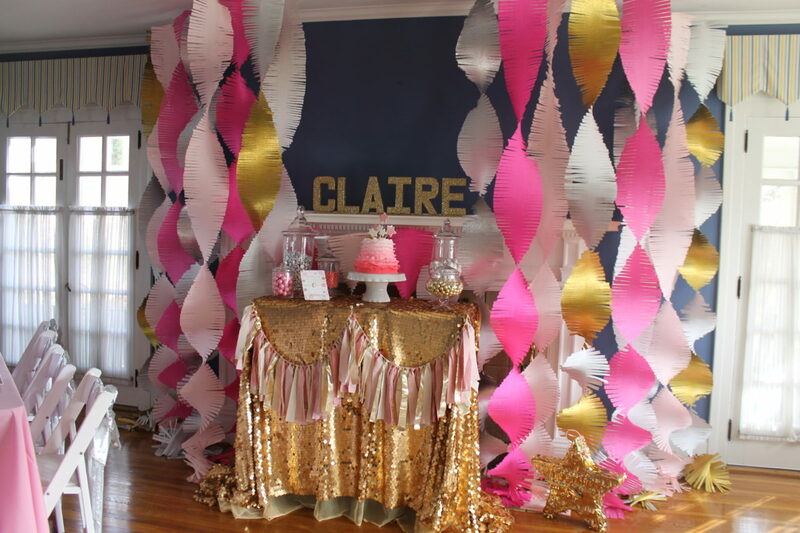 The mantle showcased gold sparkly block letters spelling out the birthday girl’s name. 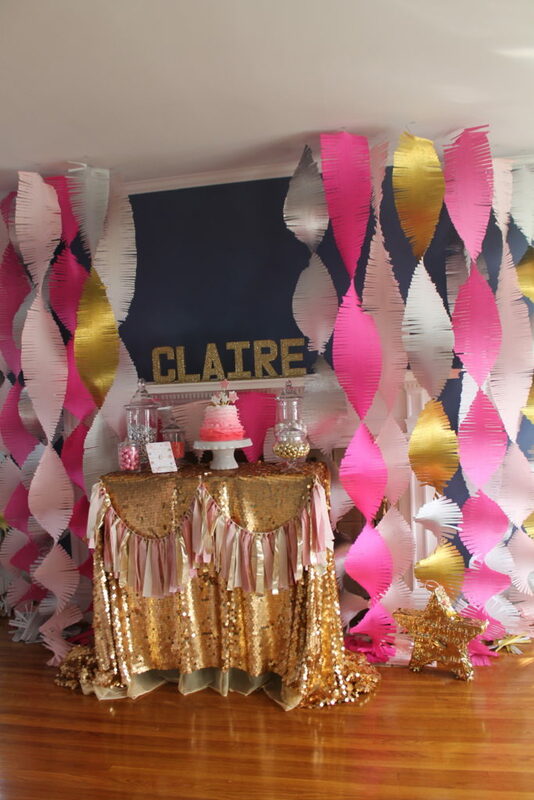 The sparkle and shine party setting was decorated! 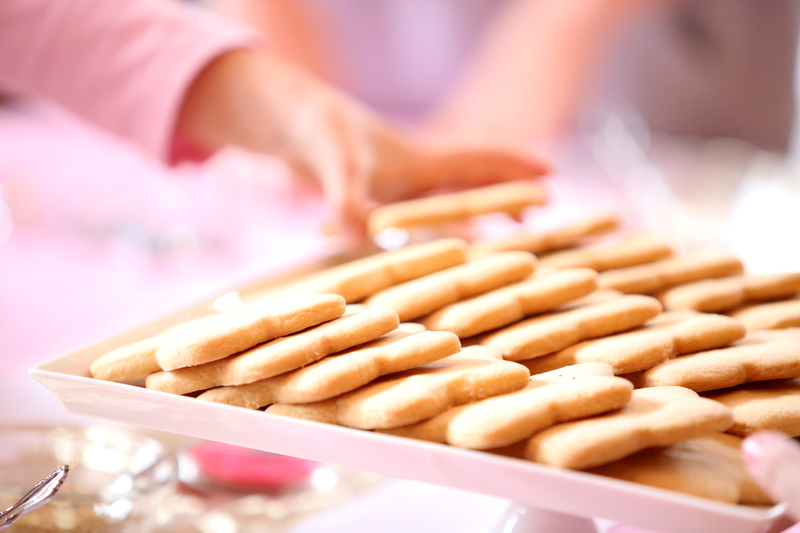 Now it was time for the guests to arrive. 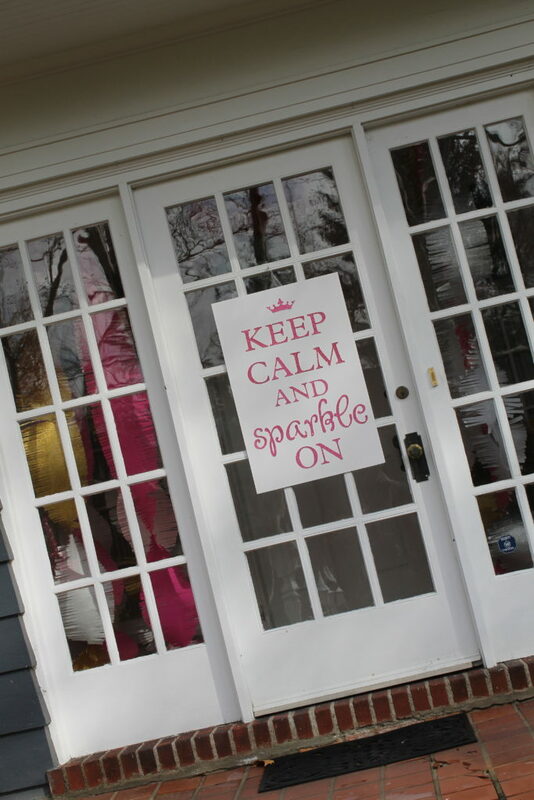 The girls were greeted at the front door with this festive sign, and then given a gold or silver star wand prop for a fun photo with the birthday girl! 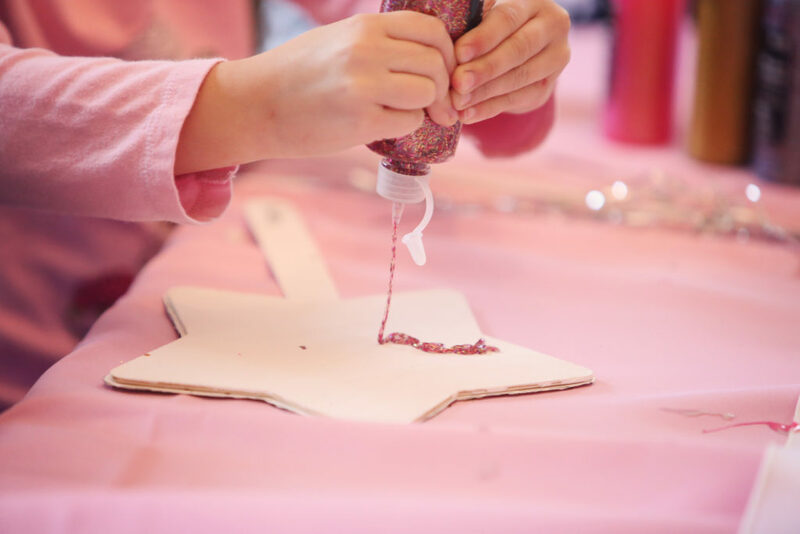 The activities included cookie decorating, making glitter play dough, creating sparkle star wands, and having glitter tattoos applied to their arms and hands. It was an unusually warm November day, so we were able to go outside for some glitter relay races. After the fun and games, the girls were invited to find their spot at the table. 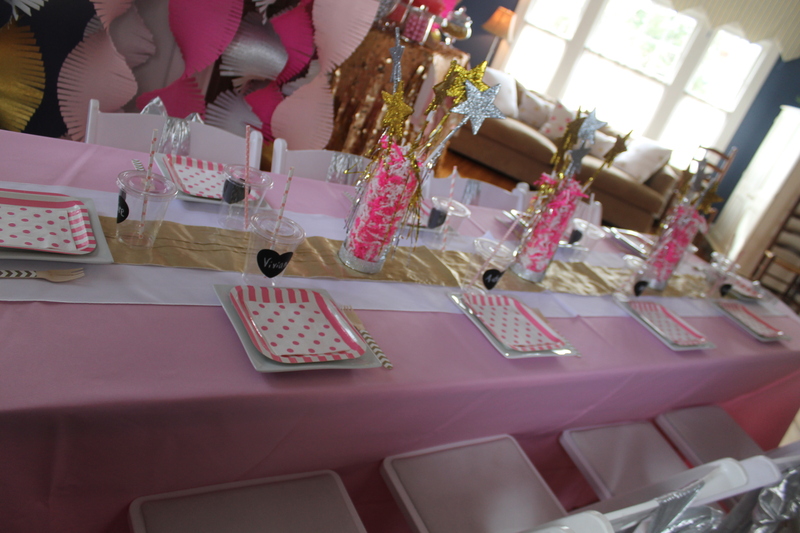 The pink and sparkly decorations were also used at the guest table. I covered the table with a pink cloth, and I used a white table runner topped with a narrower gold lame table runner down the middle of the table. 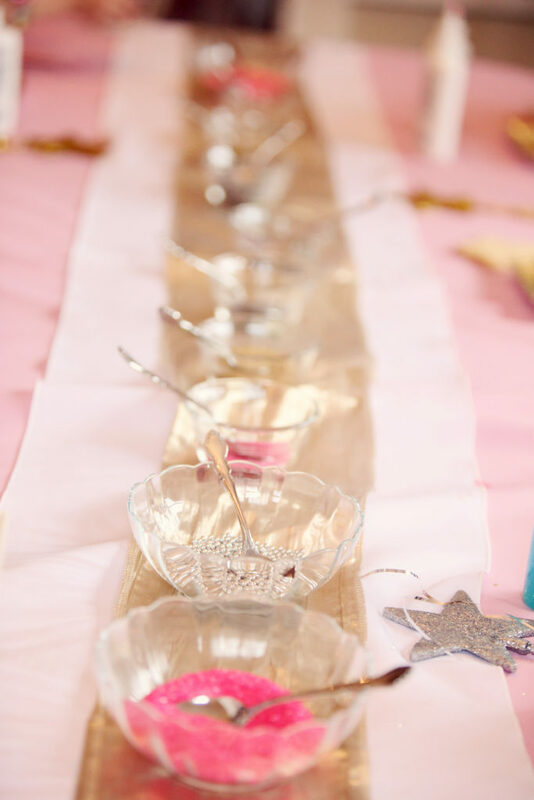 Vases were filled with pink shredded paper and more silver and gold wands to create centerpieces for the table. 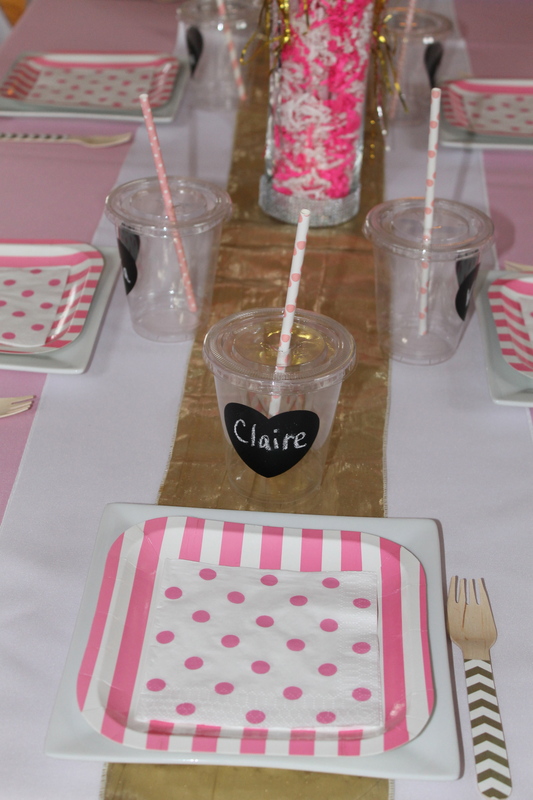 Pink polka dot (of course) plates and plastic cups with chalkboard labels for writing the girls’ names completed the look. It isn’t a birthday without a cake, and what a cake it was! 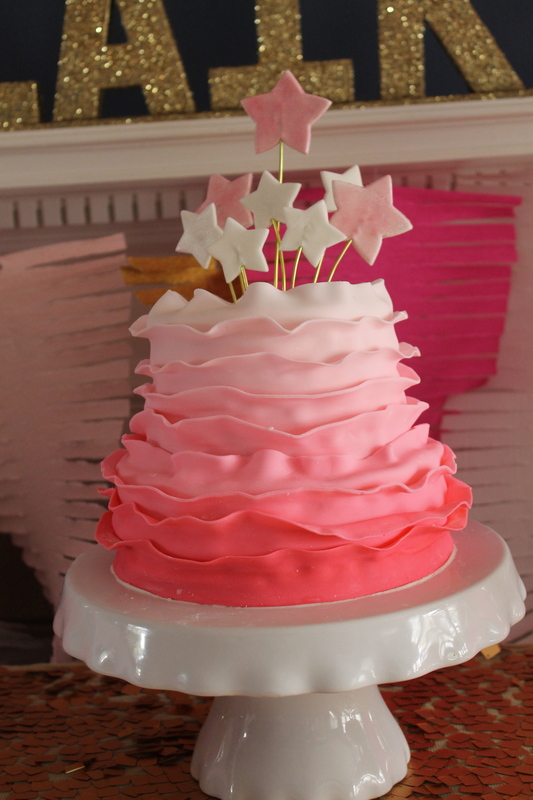 The pink ombre cake topped with the pink and white fondant stars was the perfect ending to this sweet, sparkly and shiny celebration! What girl doesn’t like a little sparkle and shine!